Note: Begin troubleshooting a no-spin condition by checking the door latch switch. If it checks good, then proceed with this flowchart. See the tech sheet with your washer for the door latch switch test procedure. The procedures described below assume that the door latch switch tests good. 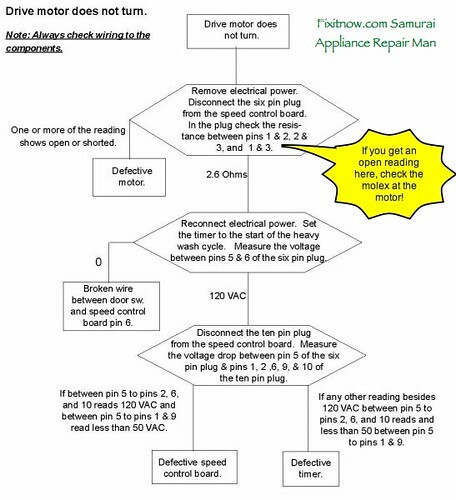 As noted in the flowchart, it’s pretty rare for the motor to fail in this washer, although I have seen it. The motor winding continuity checks are done through the motor wire harness at the speed control board (for convenience). If you get an open reading there, don’t take it as gospel that the motor is bad– repeat the test at the motor itself so that you’re not reading through the motor wire harness. The wire harness itself, specifically the molex connector, is a more common troublemaker than the motor. A more common failure item causing a no-spin condition in this washer is the speed control board. This entry was posted in Washer Repair on October 29, 2009 by Samurai Appliance Repair Man.